Seborrheic keratosis is a skin condition that can cause the appearance of wart-like skin growths. It is especially seen in people who are beyond the age of 40 years. Seborrheic keratosis is also prevalent in areas where people are subjected to a long period of exposure to the sun during normal days. Seborrheic keratosis sometimes appears in areas of the body that are not usually exposed to the sun. There are no studies that have been conducted which confirm that exposure to the sun is the cause of seborrheic keratosis. Additionally, seborrheic keratosis has also been known to occur on the skin of dark-skinned people unlike actinic keratosis, which is proven to be caused by sunlight exposure. Seborrheic keratosis warts are not cancerous which makes their treatment of purely cosmetic nature. There are many remedies that can improve the appearance of seborrheic keratosis warts and even remove them completely. The treatments vary a lot and some of them can be easily and safely carried out at home. The other treatments require people to check in at a hospital for a minor procedure. The first method of treating seborrheic keratosis warts is using glycolic acid. Glycolic acid has the shortest molecular chain among two other acids that belong to a category of acids known as alpha-hydroxyl acids. As a result, it has excellent skin penetration capabilities making it ideal for use in dermatological applications. A 15% to 30% solution of glycolic acid is used at home to treat seborrheic keratosis. The acid is applied directly over the seborrheic keratosis wart and left to stay for as long as possible. After the solution dries, the area can be washed in clean water with an exfoliating scrub. Another method of treating seborrheic keratosis warts is use of lactic acid solution. Lactic acid also belongs to the group of acids known as alpha-hydroxyl acids. The third and final acid in the group is citric acid, commonly known as Vitamin C. It is also used in some applications of treating keratosis. A 12% solution of lactic acid is used in the same way as glycolic acid is used. The seborrheic keratosis warts gradually reduce over a few days of uses. Within a period of about two weeks, the warts completely disappear and leave behind healthy skin. Seborrheic keratosis can also be treated medically in three ways. 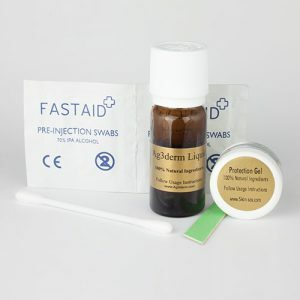 The firs method uses liquid nitrogen to freeze the keratosis warts. The other way is laser surgery where a high intensity laser beam is used to burn off the wart. The third method is surgical removal otherwise referred to as excision.